What a way to start off the the final week, with rain. :( Usually the rain brings people's mood down, but not at Camp HarborView! It was nice to see how the fishing club was still so excited to fish. The rain did not stop them from what they love. In the cold rain we fished together. Like any other beautiful sunny day where we collect bait, check the traps and fish we did in this cold, cold rain. The wind was strong and when it smacked your skin you would get chills through your body. Camp Harbor View kids? The rain was nothing. Not once did a kid say they wanted to be somewhere dry or they wanted to go back indoors. These kids love to fish and I was surprised at their attitudes towards the rain. I loved seeing how focused and full or energy they were. When their camp counselor said it was time to go they all sucked their teeth and whined. All they wanted to do was do what they love, fish! I know if these kids keep this type of attitude they will go far. Never let anything get in the way of what you love. After the fantastic day we had last Friday with all the groups we have been working with though the summer, it only made sense that they would think it was our last day. So today when we showed up for another fun day at Constitution beach, we found that the group had not arrived. They thought Friday was our last day and didn't show up. After waiting for a while, Sheuli made a phone call and eventually the East Boston Y was informed that we were holding program. 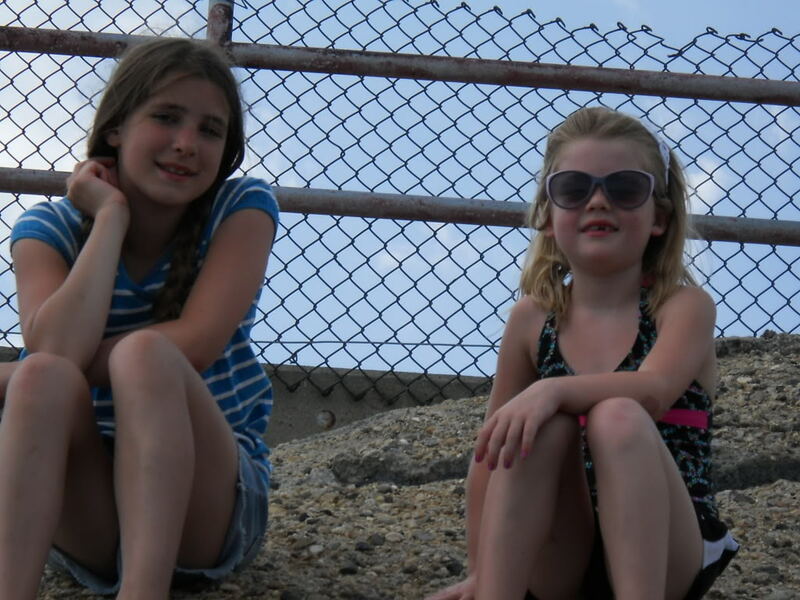 And so, even though they were only going to have about a half hour of programing by the time they got there, they still decided to make the trip to the beach. And to me, that just shows how well we have done with them this summer and how much they all enjoy spending the day with us. With the limited time we had, we were able to separate them into two smaller groups, one consisting of members that wanted to go exploring, and the others playing games. 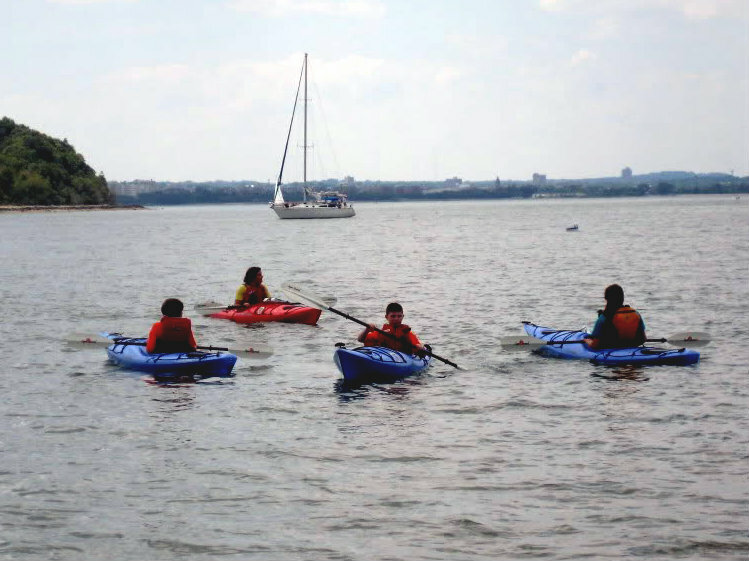 It ended up being a fun day; a great way to end the summer with the East Boston Y. 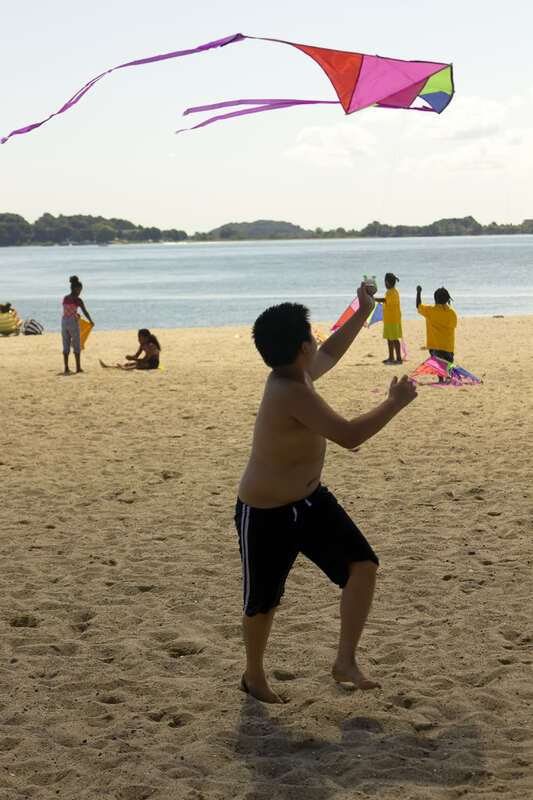 Last Friday and Saturday, we held Summer Time Splash at one of the South Boston beaches; both days turned out to be a huge success. 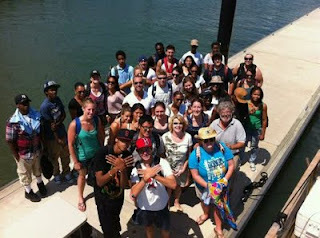 On Friday, we invited all the groups we had the pleasure of working with throughout the summer. Over 400 kids were fishing, painting, building sand castles, playing sports flying kites and eating hot dogs. It was a great day to be at the beach. On Saturday, we had much less of a turn out, but it turned into a great day regardless. We built a very impressive symbol for Save the Harbor and got to welcome the Boston light swimmers. It was a fantastic weekend, possibly the best I have had all summer. 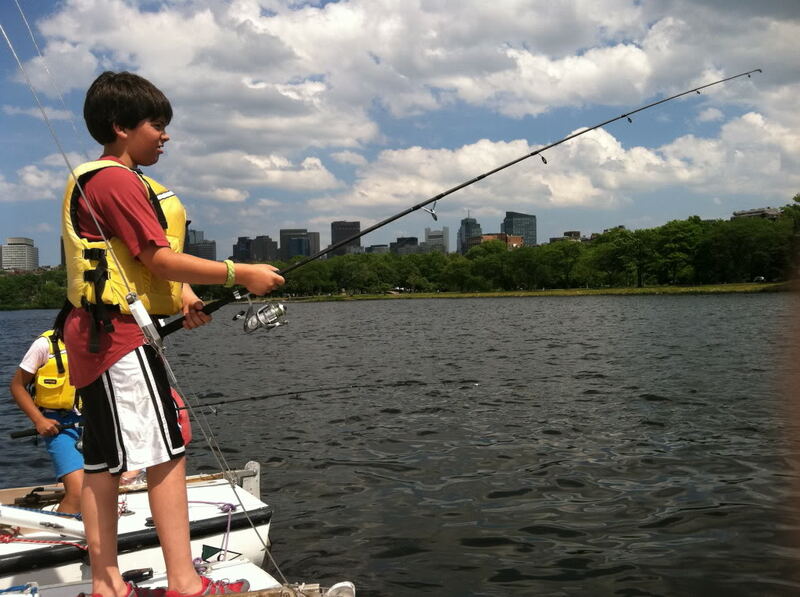 We have never had a bad day fishing at Community Boating. As soon as Annie starts mixing up carp cookies the fish swarm. We can usually reel five fish or more in a very short time, better than any other site. 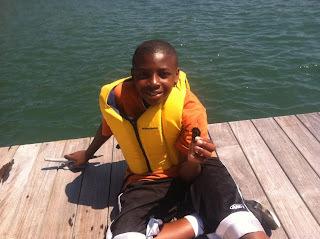 The kids all love to fish and the easy fishing is what makes CBI a really great site. My, how the time has flown! It seems like just yesterday that we were all arriving for the first day of staff training, but now here were are in the last week of the summer. 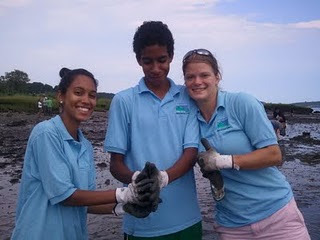 Working for Save the Harbor this summer has been an absolute blast! Every day I got to outside, play with some really great kids, and help them learn about and enjoy their harbor; you can't ask for a better job than that! If I had to choose, I would say the highlight of my summer has been working at Camp Harbor View. 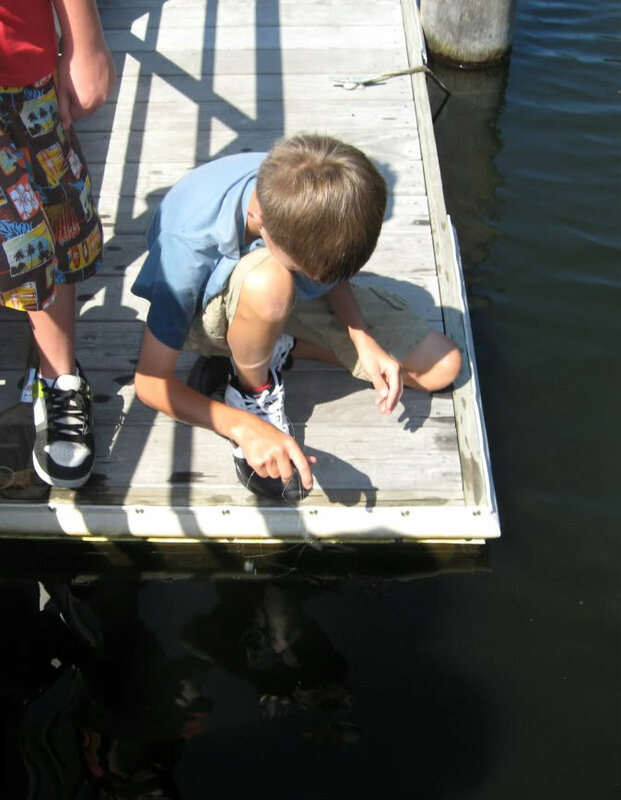 I forgot to mention this earlier, but on the last day of fishing club, Henry, my pro snail catcher, put his hand in the water, plucked a mussel off the dock, crushed it and put it on a fishing hook himself! Quite an accomplishment for a boy who two weeks earlier was afraid to even touch the water. 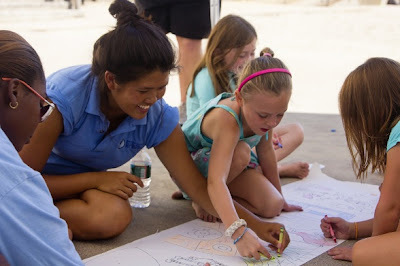 An additional highlight for me this summer has been working with and getting to know the rest of the Save the Harbor staff, especially the junior staff. It has been great to watch their confidence and experience grow over the course of the summer! 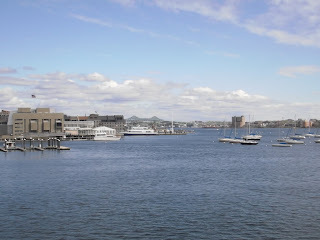 This week is not only my last week at Save the Harbor, but also my last ever week in Boston. Although I was born in the city and grew up just outside of it, I haven't really gotten to know Boston inside and out until this summer. Next week, I will be moving to Ann Arbor, Michigan to begin my PhD studies at the University of Michigan (Brianne's alma mater!) in ecology and evolutionary biology. While I won't get to be outside or go fishing as much, I will still get to teach and work with snails. 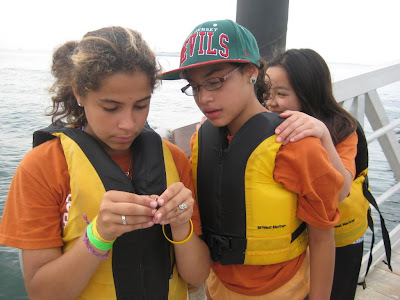 Working for Save the Harbor has given me a new appreciation for the challenges of integrating sound science, education, and policy, some great memories, and a pretty decent tan. All in all, it's been a great summer that I won't soon forget! After a summer of hard work pulling up traps, turning over rocks, and measuring fiesty crabs, it's now time for the fun part: putting all of our data together and looking at the results! 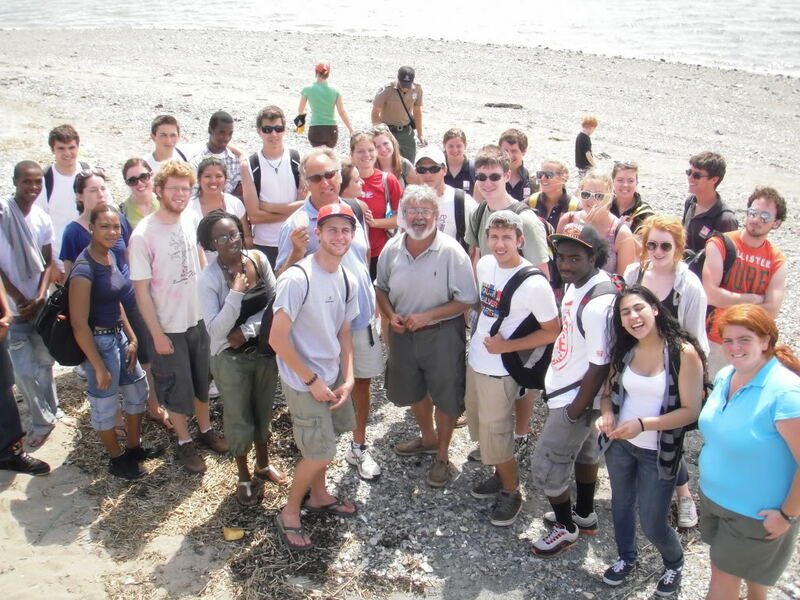 In total, we caught and measured 493 individual crabs this summer! 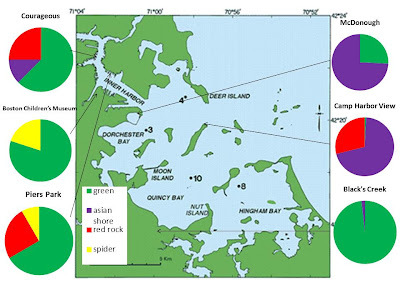 From our total numbers, it certainly appears as if invasive Asian shore crabs and green crabs are the dominate species in Boston Harbor, but let's take a closer look at our individual sites. Asian shore crabs, the most dominant species in our total, are actually only the most common species at two of our six sites: Camp Harbor View on Long Island and the Harry McDonough Sailing Center in South Boston. These sites are both rocky and gravely beaches where we searched for crabs in the intertidal zone (the area between the high and low tide marks which is sumberged for only part of the day). Asian shore crabs do very well in the intertidal zone because they are better than other crab species at tolerating the dryer conditions of this habitat. Black's Creek in Quincy is also a gravely beach where we searched for crabs in the intertidal zone, but we found almost exclusively green crabs at this site. Why no Asian shore crabs? Black's Creek is a Salt Marsh Estuary where fresh water mixes with ocean water and lowers the salinity. Green crabs are very tolerant of a wide range of different salinities, but Asian shore crabs can't survive as well in the low salinity of Black's Creek. 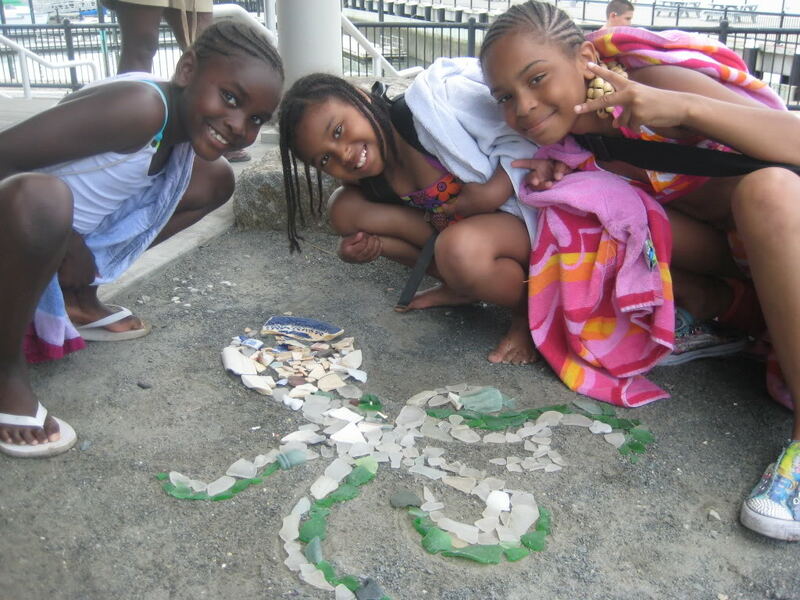 Green crabs are dominant at Piers Park Sailing Center in East Boston, Courageous Sailing Center in Charlestown, and in Fort Point Channel at the Boston Children's Museum as well. These crabs were introduced to New England in the early 1800's; their quick reproduction and adaptability to a wide range of conditions have allowed them to easily outcompete native crabs, so it is no surprise that we found so many of them. At Piers Park, Courageous, and the Children's Museum, we caught crabs from the subtidal zone (the area that is always submerged, even at low tide) using traps. At these sites, we saw two additional spcies of crabs that are not as tolerant of the dryer intertidal zone. 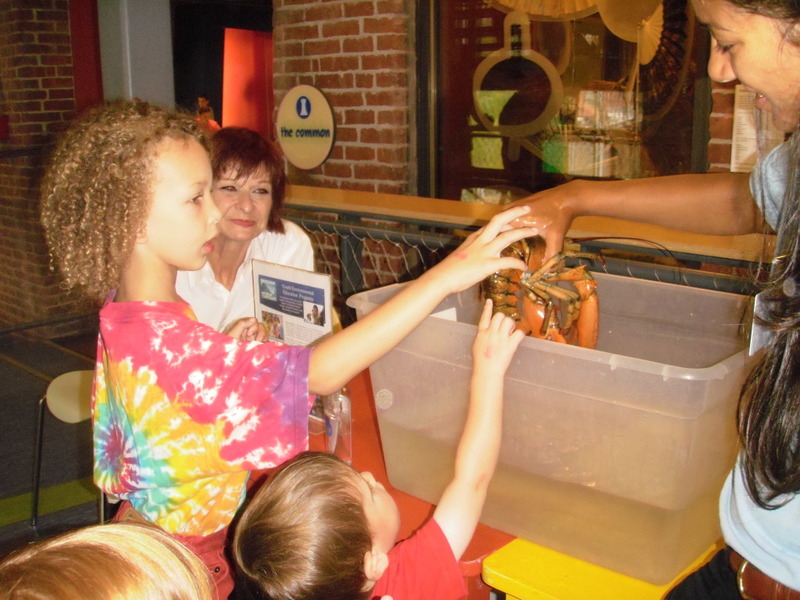 Red rock crabs were common at Piers Park and Courageous, and spider crabs were found at Piers Park and the Children's Museum. Although we never saw the sea floor at these locations, the species of crabs that we found at each of them can actually tell us a little bit about what the bottom is like! Red Rock crabs (as you can probably guess from the name) like habitats with lots of rocks, while spider crabs (a type of mud crab), prefer muddy bottoms. 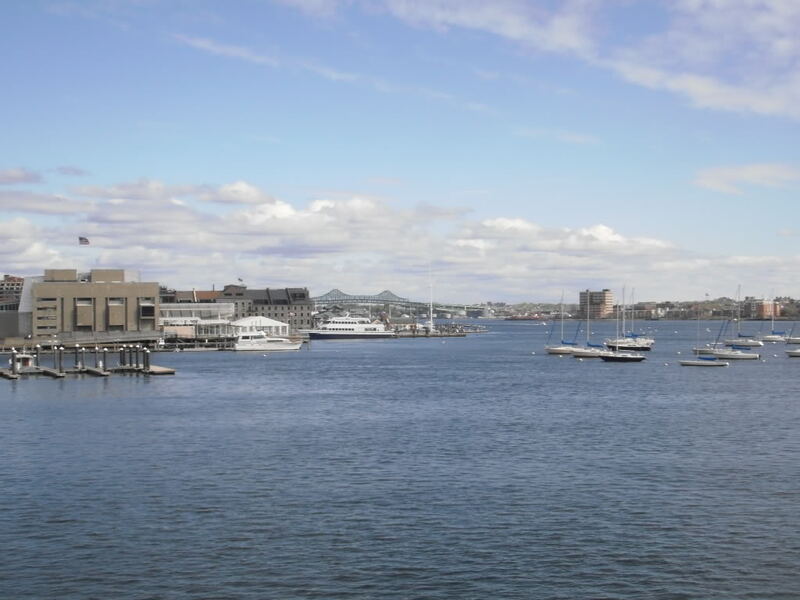 Based on the data we collected, Courageous probably has a more rocky bottom, Fort Point Channel has a more muddy bottom and Piers Park likely has a mixture of both. This is only a small example of the kinds of things we can learn from the crab count information we've collected this summer. We'll be sending all of our data along to Dr. Judy Pederson at MIT who will use it to study the spread of invasive species. Hopefully, she'll keep us posted on what she finds! we still managed to catch some sunfish, catfish, and eels. who had her own method for fishing. It was so successful that she caught not 1, not 2 but 3 fish. so she knew when the fish were coming. and I regret doubting her method completely. This week I was at Piers Park and Courageous Sailing Center with Paula and Scott. The day was like every other day at Piers Park. We play games and go fishing and try to get some lobsters. As for Couragoues Sailing Center, we got a lobster, crabs, star fish, and a little girl got a fish! 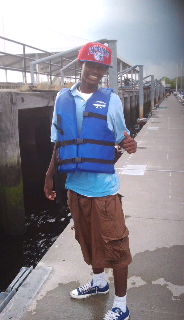 The day was fun. I got to go sailing with the sailing people. After the program was over, me and Paula stayed for extended time. That's when the little girl caught her fish. The kids started to leave, and after everyone left, I fell into the water! Paula screamed and she pulled me out the water. Super man style! Summertime Splash was an exciting day. 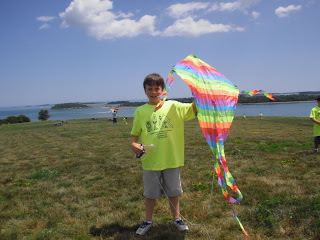 It was exciting because I had the opportunity to fly kites with all the different kids and just enjoy the nice weather. The highlights of my day were actually getting a kite to fly in the air for a little girl. Watching her smile made me light up with joy. Another highlight was ultimate frisbee; I've never played an organized game of frisbee before saturday. My most memorable moment of Summertime Splash was trying and successfully fighting off the staff not to throw me in the water. I love these type of events because not only does it give you the opportunity to have fun with the kids it also forces you to bond with your co-workers. I can't wait till the next event this saturday. Last week I was at a beach party for all the kids, and some great food was provided by Bruce and Patty. I was with Hugues,Mikay,Aruna and Carolyn. We went kite flying. I had a lots fun there and I'm sure the kids did too. All the kids got to jump into the water together, which was a lot of fun for them. 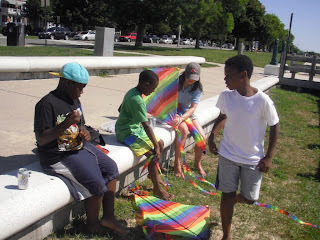 Most of the kids that were lucky enough to fly kites got their kites up and running quick. I personally had so much fun there because I got to run around a little, and I got to do all the good stuff they had there. 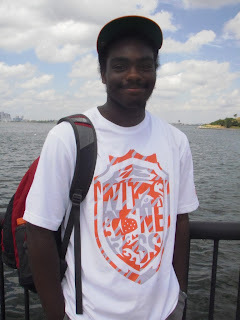 My name is Mekhi Wright-Hopkins and I am 15 years old. I am from Dorchester, MA and I go to Proctor Academy: a private boarding school in New Hampshire. I work for Save The Harbor/Save The Bay, and my experience with working with this organization was extraordinary. They have taught me so much such as: fishing, setting crab traps, and pulling up lobster traps. Not only does this organization work on the skills you need to work here, but they also teach you leadership, patience, responsibility, and many other life skills. As a younger activist in my community, one of my suggestions to further the Harbor's success even more is having more "beach events" in more diverse areas such as Dorchester, Cambridge, or Brighton, to name a few. The other events in Quincy are awesome but, it doesn't involve urban city kids that much. 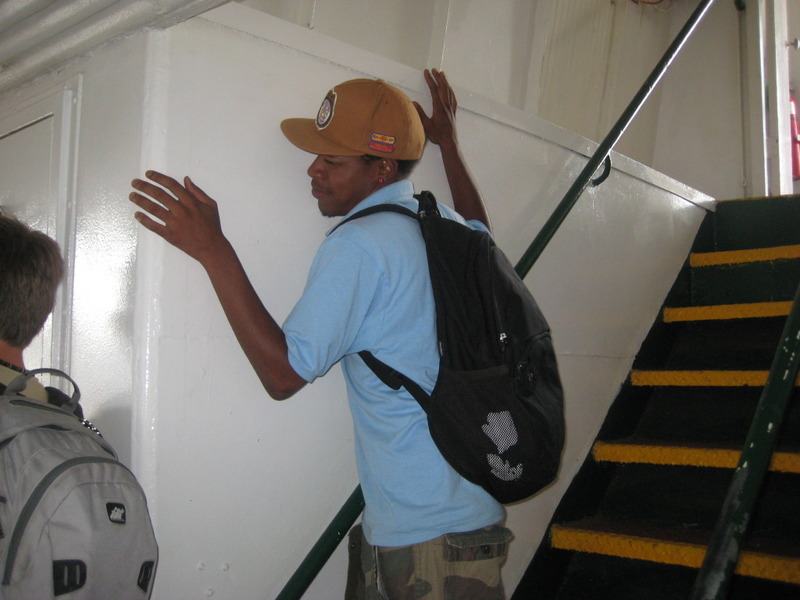 It also leaves those kids that aren't from Quincy or other surrounding areas ignorant about the harbor. 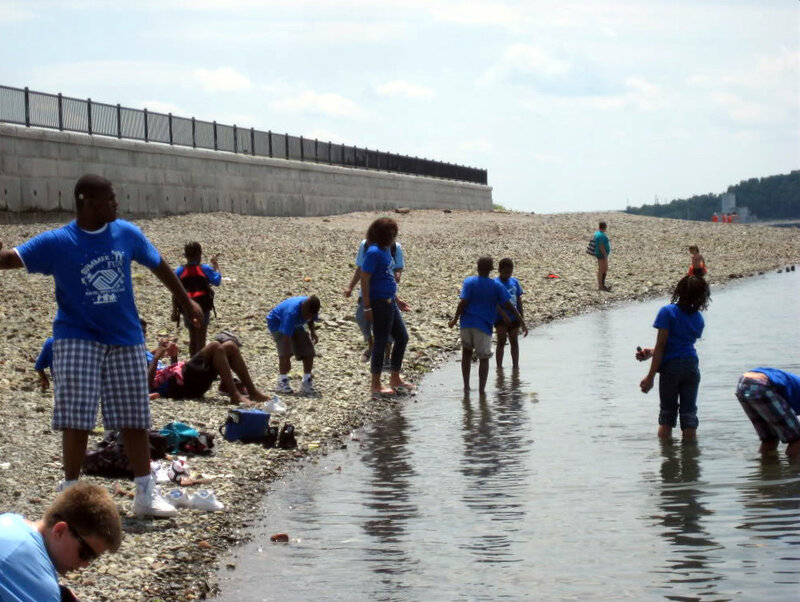 I bet many of those kids who can't make it to these "beach events" that are far out don't even know that the we have one of the cleanest Harbors in America! 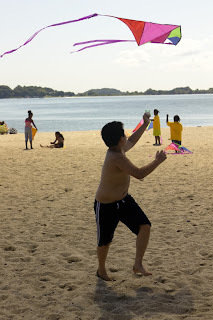 My wish, Mayor Menino, is that you expand your beach fun to make it accessible to every neighborhood of Boston! Thank you for taking the time to listen to my thoughts and suggestions. 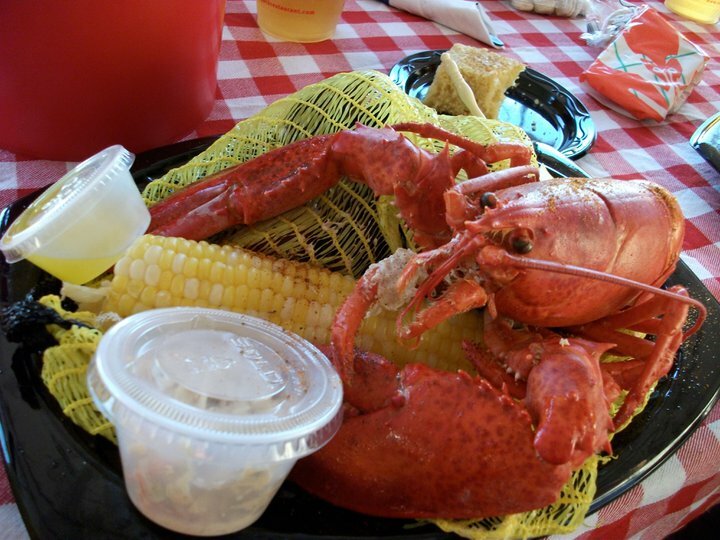 Being from California, I had never heard of a ‘clambake’ before, nor had I ever had lobster (I know, pity me!). But if that picture is any indication of how good that guy tasted, then you can be pretty sure I’ll be back for another one! 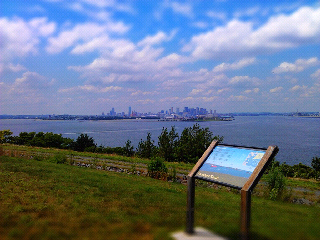 A few of us went out to Spectacle Island, where we were served delicacies of the New England type. Your regular lobster, clams, and mussels, along with some potatoes and corn. Then we passed the time by talking and watching the sunset fade behind the Boston skyline, as the skyline itself began to light up the night. 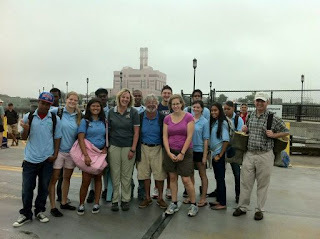 What a great way to wrap up my internship at Save the Harbor. Flying out from LA, I didn’t know exactly what to expect in terms of my duties and responsibilities, but I definitely didn’t expect to sail out to Spectacle Island to talk to kids about what they were learning so that I could go back and write up a relevant press release. 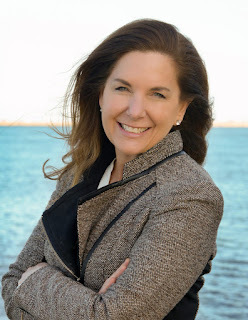 Nor did I expect to do research on the history of Spectacle Island and help put together a “Treasures of Spectacle Island” pamphlet that would be used on the island as a resource to explain the abundance of sea glass and pottery, and other artifacts on the shore. I learned a lot about what I might like to do (and not do!) over the course of the summer and from this internship. I know it will serve as a stepping stone for doing something worthwhile down the road. Thanks to everyone at Save the Harbor and I hope to see you all very soon! On Monday, it was raining a lot, and it felt worst while at Camp Harbor View. The rules is that rain or shine fishing club must fish as long as there is no thunder or lightning. So I am glad I came prepared with a rain jacket, because it was raining hard! The kids were not as prepared, and I thought they would complain the whole time. So Sarah, Paula, and the rest of our group decided we would scream "this is great," every time a kid complained. Not one child complained though , they were all ready to fish! It ended up being a lot more fun then usual, because all the kids enjoyed fishing in different weather. We did not catch a fish but we had lots of fun, and we eventually got out of the rain. Something I found interesting was, when it was raining kids were a lot more concentrated on fishing. Only one child tangled their fishing rod when usually our staff sits and untangles rod about every five minutes. I do not wish to get rained on again, but I can not wait to go back to Camp Harbor View to a group of kids excited and prepared to fish. Although yesterday was a rainy day, we were still able to have a great day INSIDE the Children's Museum. Because of the weather, we decided to hold an indoor touch tank exhibit. 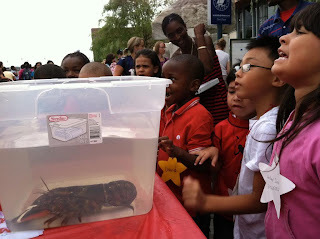 We had a live lobster for the kids to pick up and learn about. It felt a lot like a beach event! The touch tank attracted a ton of kids too! Everyone that passed by wanted a chance to touch the lobster. It was a big hit! It was really awesome to be able to reach out to even more kids then we usually see. 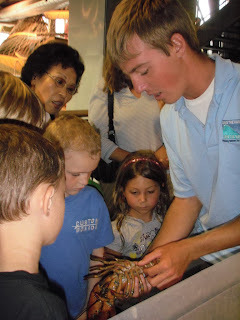 This was the first time I had ever done a touch tank inside the museum and I was glad it went so well. In the future, this might be a cool thing to have in addition to the fishing and crabbing outside. I would definetely say we made the most of a bad weather day. This Saturday, we found ourselves returning to the Curly Rec Center for the second day in a row. 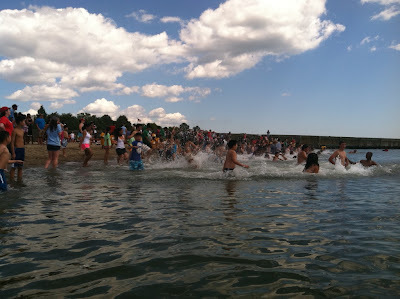 The event was the Summer Splash which was an open beach event for friends of the Harbor and was occurring just as swimmers from the Boston Harbor Light Race were crossing the finish line. Before we had a big old splash in the Boston Harbor to celebrate the South Boston beaches for having the cleanest urban beaches in America, we decided to organize a quick game of Ultimate Disc between members of the staff. Ultimate Disc is played with a Frisbee and is very much like a cross between basketball and football. You attempt to throw a pass into the touchdown zone without getting blocked or letting it touch the ground. Also, When in possession of the disc, the player must establish a pivot foot and remained rooted to the very spot. They then must pass the disc to one of their teammates before the opposing player covering them counts to ten "stalls". Michelle and I were the two captains who selected teams. My team worked extremely hard and there work paid off, we soundly crushed the our coworkers. Everyone preformed really well but I got to hand it to Leon with his game changing interceptions and Ahmed with his fantastic touchdowns. After the game we later ran into my buddy Paddy, a young sailor at The McDonough Sailing Center. He ended up playing toss with Tommy and I, where he was not ashamed to show off his Frisbee skills. Paddy started off the summer not knowing how to throw. But this year he has pretty much mastered all the throws. 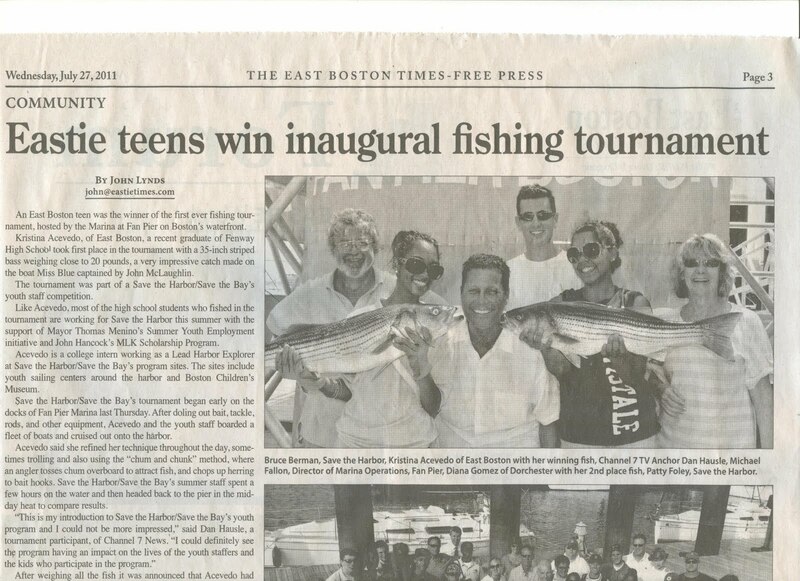 I was very impressed and hope that him and the other Southie kids keep up with the sport. South Boston could rival Amherst as the new hots spot for Youth Ultimate. Friday, August 12. I had no idea what to expect for this event that has been looming over my head for at least a month. Conor, BJ, and I, as part of the Youth Committee, were hosting the Summertime Splash at the Curly Community Center. The day before the event, I realized I had my own station and had to prepare the murals and posters for the kids to color in. It took me the entire day and night for me to be satisfied with my work. I had drawn a huge flounder, an oilfish, and a 30 ft long seabed with 8 signs. I woke up bright and early to arrive at the center by 8:30, lugging along the signs that I had painted only a few hours before. As the entire staff helped set up all the stations, my excitement grew and grew. We sang the famous sea shanty, Haul Away JOE! The moment that ended, every single person lined up along the shore and at the count of four, we all ran in at once! I had so much fun with all the groups that came! I want to thank everyone who made it happen and made it an AMAZING day! 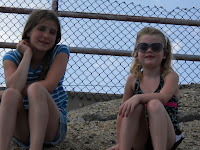 Friday Aug. 12, 2011 we had a very cool beach party. The beach Party was really fun and i enjoyed it alot. That day was just for the children from all over, from different neighborhoods in our community. We had many different actives for the kids, flying kites, fishing, sand castles, sports center, art, and the best of all was the history about the Harbor Island. 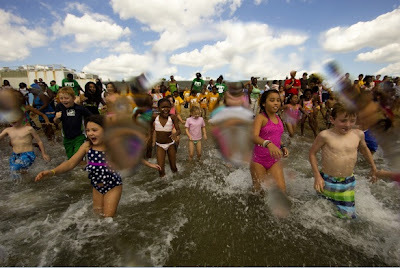 I never seen so many kids all in one place running around, enjoying their day at the beach with their friends. The BEST thing that happened that day was when EVERYBODY ran into the beach all at the same time. That was really fun and funny!! We give out food, drinks, and fuirts and veggies to EVERYBODY!! at the end we had to clean up, now that part was very funny becuase every one was saying they already did somehting oh man that made my day evern better ! !